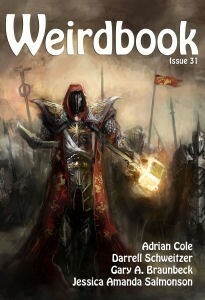 Weirdbook is back! If, like me, you’re a fan of W.Paul Ganley’s World Fantasy Award winning original run of the magazine, which was published from 1977 to 1997, then you’ll need to hear no more. 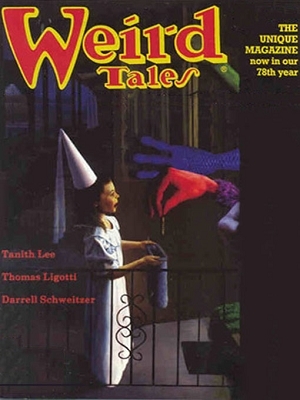 There have been many attempts to revive Weird Tales over the decades and the most recent is still running. For me, one of the best, most successful wasn’t even called Weird Tales. It was called Weirdbook. It’s so good to have it back, but does it hold up against the best of that original run? 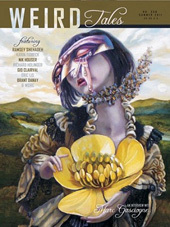 The magazine hits the ground running with John R. Fultz’s “Chivaine”, and I have a new name to add to my list of new (to me) authors to watch. A dead hero is brought back to defend the land against a brutal invader. It’s classic sword and sorcery, told in a style that reminded me of Lord Dunsany. They don’t write ’em like that anymore—except it seems they do. 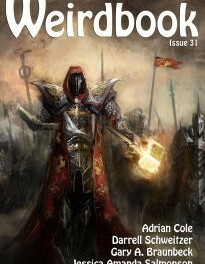 This magazine’s association with fantasy awards is strengthened by the inclusion of a new Nick Nightmare story by Adrian Cole. In “Give Me the Daggers”, Nick Nightmare has to call upon the “Astral Surfer” to help him solve a case involving a carnival that travels between worlds, and the Angels of Malice. It’s a worthy addition to the tales which won him the 2015 British Fantasy Award for Best Collection. In “The Music of Bleak Entrainment”, Gary A. Braunbeck takes us into what will be familiar territory for many readers, but he does it via a very unfamiliar route. I can’t deny that I found the journey more interesting than the destination. The tone shifts to pure horror as Christian Riley gives us “Into the Mountains with Mother Old Growth”, a genuinely scary tale of the thing encountered by a city man, while hiking through the forests of north Washington. A man finds himself trapped underground in a cave, with a magical being who wants his heart—one way, or another. “The Grimlorn Under the Mountain” by James Aquilone has a creepy Brothers Grimm quality to it. I really liked Paul Dale Anderson’s “Dolls”, which introduces us to a very different interpretation of witches—creatures that have to feed on the inner beauty of humans, because, if they don’t they become what they eat. “Gut Punch”, by Jason A. Wykoff is quite hard to describe, so I won’t. I’ll just say that it’s one of several truly excellent tales in the magazine. Another is “Educational Upgrade”, by Bret McCormick. A man visits an establishment in an extremely dodgy district, where he hopes to find a way to be taught Mandarin Chinese, very quickly. It’s a great stand-alone story, but I’d like to see it expanded with more tales of Mind Expansion Enterprises. Darrell Schweitzer was a regular contributor to the original run of Weirdbook, and one of my favourites. “Bones of Dead Children” certainly doesn’t change that opinion. The very rich protagonist simply wants to be left alone, so he buys himself a house on a remote peninsular on the Maine coast. It’s huge, an insane mix of architectural styles and, of course, haunted. “The Forgotten”, by D.C. Lozar was something of a surprise, and the least pulpy tale in the book. Running just over three pages, it’s a deeply poignant look into the mind of a lonely old man. We appear to be firmly into the flash fiction portion of the magazine by this point, as Jessica Amanda Salmonson contributes “Coffee with Dad’s Ghost”, a single page dream story, followed by Greg Chamberlain’s “Missed it by That Much”, an amusing two page tale of an author trying and failing to break out of his literary rut. Both are considerably more interesting than those brief descriptions sound. Erica Ruppert’s “A Clockwork Muse” is a story concerning artificial life-forms that comes straight out of the Twilight Zone, while Kurt Newton’s short short, “The Rookery”, is just plain odd. “Odd” certainly also applies to J.T. Glover’s excellent “Wolf of Hunger, Wolf of Shame”. This is yet another one of those stories that is hard to describe without spoilers. “Zuchini Season”, by Janet Harriot, is a wry little flash piece, in which an avatar of death does his latest charge a favour, albeit probably not in the way she would have preferred. Llanwyre Laish’s “The Jewels That Were Their Eyes” is another of the better stories in the collection. The leader of a cadre of ravens, charged with gathering shiny eyeballs to decorate the nest of the raven king, is set upon another path when he meets those who loved the dead owner of his latest intended prize. Kevin Strange certainly lives up to his name with “The Twins”. It could almost be considered an exceptionally original take on the vampire trope. Another serious prospect for nomination on “best horror short story” award lists, I think. Finally, we have “Princess, or Warrior”, S.W. Lauden’s interesting cross between a drug trip and a time travel story, in which the protagonist tries to fix his disastrous life. I haven’t even touched on the poetry in this issue. 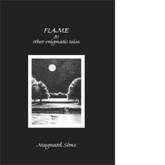 There are eight pieces of verse, of varying length, by Ann K. Schwader, Frederick J. Mayer, K.A. Opperman, W.H. Pugmire, Ashley Dioses, Wade German, Dave Reeder and Chad Hensley. I’m not confident criticising poetry, but Schwader and Reeder were my personal favourites of the batch. To answer my earlier question: yes, it certainly lives up to the quality of W. Paul Ganley’s original run of the magazine. The new paperback format, with glossy colour covers is an obvious improvement, although I’ll admit that I kind of missed the old A4 magazine format, with black and white covers, even though that wouldn’t be likely to sell well in today’s market. My nostalgic feelings were somewhat assuaged by the lovely black and white back cover picture by Stephen Fabian, who was the mainstay of Weirdbook cover and internal artwork during the original run. The full colour front cover artwork by Dusan Kostic is very good too. 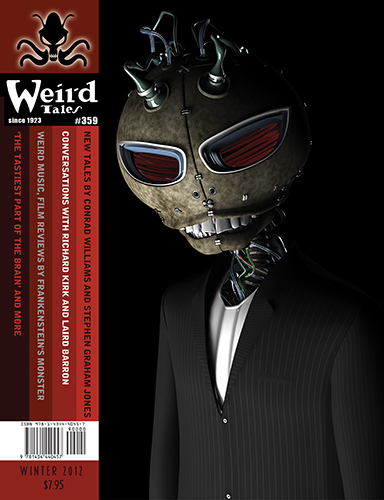 Weirdbook is back, and it simply can’t be allowed to go away again, so I hope it sells as well as it deserves to, which would be very well indeed.